Excel is an absolutely essential tool for virtually any business. When you need to organize your invoices, track customer data, inventory your assets, or perform a variety of other vital tasks, you likely turn to this program. 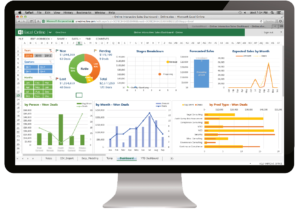 Excel is so versatile, however, that in many cases, it takes a true master to harness its full potential for your company. Partnering with an Excel enthusiast can ultimately save you money, time, and hassle, streamlining your operations so you can succeed. That’s where we come in. Get Excel Help employs only the most expert Excel consultants, programmers, and instructors. Our team is devoted to helping businesses optimize their operations with the power of this Microsoft program. Since we understand that you’re trying to expand your enterprise with Excel, we’ve worked to make our assistance as affordable as possible while maintaining quality service. With Get Excel Help, you’ll collaborate with esteemed Microsoft MVPs (the highest echelons of recognition from the company itself) for astonishingly low prices. Our diverse pool of talents allows us to be flexible with our rates. With our innovative model, you’ll avoid overspending while securing true Excel expertise. There is no need to roll the dice with flighty freelancers or questionable consultancies. Get Excel Help provides a wide range of state-of-the-art services. We can consult with you to point you in the right direction on your Excel-related projects, provide custom VBA programming for your system, and train your team to use Excel like pros. Contact us today to learn more about our offerings and schedule a free consultation! Not sure where to start or what you need? We’re here to help. Get a consultation at no charge and we’ll point you in the right direction.